February usually has 28 days, but every four years an extra day is added to make 29. The earth take 365 days, 5 hours, 48 minutes and 46 seconds to travel around the sun, so every four years one day is added to even things out. People also do some wild things on Leap Year Day to make it different. 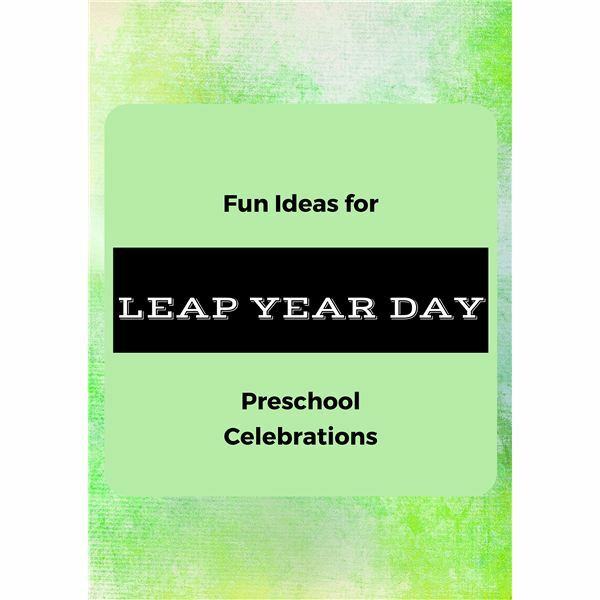 Try a few of these fun ideas with the kids to make Leap Day a special day in your classroom or household. How do you tell your child that his/her birthday only comes every four years? Where is February 29th on the yearly calendar? Reading stories in these books may help. Show the kids how to wear their clothes inside out or backwards. Conduct a backward relay race, starting at the finish line. Let the kids pretend to be frogs and do this exercise. Squat down with their arms out in front. Then have the kids jump forward, raising their arms high in the air before returning to the squatting position. Make this a fun game and tell the children to jump fast and slow making ribbit sounds as they leap. What other animals jump and leap? (Kangaroo) Why not set out large hula-hoop rings and have the children jump in and out of the circles. Frogs have long sticky tongues to catch insects to eat. On Leap Year Day, play “Pin the Tongue on the Frog” game with the same rules as the traditional “Pin the Tail on the Donkey” game. Draw a large frog on cardboard and paint it green. Decorate the frog and hang this on the wall at the child’s eye level. Trace and cut out long, red tongues for the frog (one for each child in your group). To play the game, place a piece of rolled cellophane tape on the back of each tongue shape. Blindfold the child and with your close supervision, lure him/her to the frog on the wall. Have the child place the tongue where they touch the wall. After each child has had a turn, see who has come the closest to the frog’s mouth area. Staying in the frog theme for Leap Year reminds me of a fun game my kids in preschool used to play. Cut out about ten large green Lilly pads from construction paper. Tape these down on the floor. Play some music and let the children dance jumping from pad to pad. When the music stops, everyone needs to be on a Lilly pad. If you want to make this game like musical chairs, have enough pads per child playing this game. When the music stops, remove one pad. If a child doesn’t have a pad to stand on, they are out. Continue playing until one person is left standing on the final Lilly pad. Since February 29th only comes every four years, it’s a great opportunity to make a timeline. Invite the children to write down their favorite things like foods, books, movies or songs on slips of paper. Place these inside an empty water/juice bottle. Make one for each child in the group. Have the children decorate the bottle with stickers. Have them take this home with a note to the parents to hide this bottle until the next Leap Year (February 29) comes. On that date, grab the hidden bottle and have fun reading the notes together. It’s amazing how our tastes change. Do this as a tradition every four years. Start thinking now of outrageous, unique and backward things to do once every four years. This is a day to have fun and let your imaginations run wild.